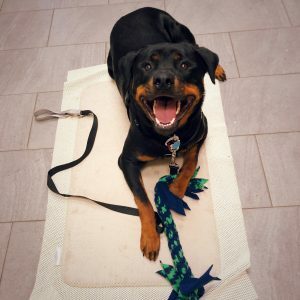 The New Normal: One Dog's Journey to Happy Vet Visits - Melanie Cerone, Ph.D.
Zeke got a shot at the vet’s yesterday and I didn’t cry. My training partner and I didn’t celebrate at the end. There were no tearful calls to Zeke’s supporters afterwards. No celebratory Facebook post. This vet visit was over before we knew it. Zeke greeted his veterinarian and vet tech happily, stationed with his muzzle in my cupped hand like a champ, the vet did a couple of warm-up approaches with the syringe, and then injected him. Zeke’s nub-of-a-tail never stopped wagging. Zeke’s reward for this stellar performance? Stinky green tripe. The whole process was over in less than two minutes. So why did I feel a little let down? Zeke’s journey began with a call from Dr. Robert Lawrie, Medical Director of VCA Old Marple Animal Hospital, about a “super mean” dog who was scheduled for sedation and vaccinations the following day. 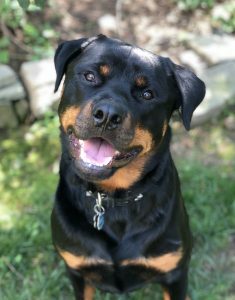 Zeke was an 18-month-old, 106-pound Rottweiler who had been discharged from two different veterinary practices due to aggression. Zeke wasn’t able to receive basic veterinary care despite muzzling, sedation, and restraint. He was overdue for vaccines and needed blood work. Dr. Lawrie asked if I would be interested in meeting Zeke to assess if he might benefit from training to reduce his fear and anxiety. Dr. Lawrie didn’t really think Zeke was a mean dog. In fact, he described Zeke as “misunderstood.” He realized that Zeke’s aggression was rooted in fear from past scary experiences. Dr. Lawrie was concerned that if he sedated and “wrestled” Zeke to administer his vaccines, Zeke would become even more sensitized, and ultimately the outlook might not be good. 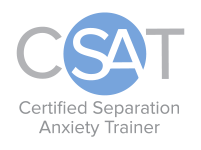 Dr. Lawrie had seen videos of me training my dog, Wyatt, to be a cooperative participant in his veterinary care through The Academy for Dog Trainers’ Husbandry Project. The goal of the Husbandry Project is to help dogs become comfortable with veterinary procedures through the use of carefully crafted, fully vetted, and field-tested training plans. I was fortunate to have the support of Dr. Heather DiGiacomo, a Fear Free Certified veterinarian, who allowed me to train Wyatt at the Newtown Square Veterinary Hospital. Through classical conditioning using novel, high-value food, Wyatt developed positive conditioned emotional responses to the hospital waiting and exam rooms, to Dr. DiGiacomo and her staff, and to being placed on an exam table. Through an operant conditioning training plan, Wyatt learned to “station” or maintain a stand-stay with his muzzle in an hand-tunnel. At the end of training, Wyatt stationed for his vaccinations, as well as a saphenous vein blood draw, during a routine veterinary visit. The Husbandry Project training negated the need for restraint during these procedures and resulted in the least stressful veterinary visit we had ever had. I met with Zeke and his dad, Dave, at the clinic the next day. 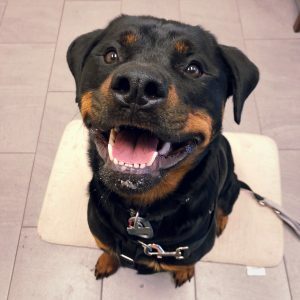 Zeke was a handsome, playful Rottie who proved to be a fantastic learner. Dave described Zeke as a great dog who had been traumatized at earlier vet visits by “sneak attacks” and a blanket thrown over his head during vaccination attempts. Sadly, these methods were unsuccessful and only served to worsen his fear and aggression. And they were quite stressful for Dave to witness. Zeke also had suffered from adverse effects of sedation, leaving Dave worried and frustrated. I explained how training would proceed, and that I would use only positive, humane, evidence-based training methods. Dave was willing to try anything to help Zeke. In the end, we jointly agreed that Zeke would not be sedated and his vaccines would be postponed in order to give training a chance. Armed with my binder of Husbandry Project training plans, a Baskerville muzzle, various veterinary implements, and an endless supply of novel, high-value food, Zeke and I commenced training. Zeke’s family opened their home and entrusted me to work with him on a day training basis. The initial steps of training took place at home, then we took field trips to the vet clinic for practice. Dr. Lawrie could not have been more supportive and accommodating. He gave us regular access to a large exam room for training and ensured that we had everything we needed during our visits. Along the way, I enlisted the help of a talented trainer, Joan Forry, who was willing to dress-up in scrubs and play the role of a vet tech to help work through various training plans at the clinic. It took a village. Three months, 14 training sessions, six Husbandry Project plans, one fabulous training partner, and innumerable high-value treats later, Zeke was scheduled to receive his first vaccination. I couldn’t sleep for days before his appointment. It was time to show the skeptics the power of positive training. On the day of the appointment, Zeke happily bounded into the exam room, his nub wagging. He had come to associate the vet clinic with food and fun. He was so excited to start stationing that I could barely place his mat on the exam room floor. Joan came to the appointment decked out in her scrubs so we could do a few warm-ups before the actual procedure. Zeke stationed like a rock star while Joan approached and poked him with a needleless syringe per the training plan. Treats flowed. Zeke was ready. It was show time. Dr. Lawrie willingly shed his white coat prior to entering the exam room. Zeke greeted him happily and then looked to me and Joan for treats. Zeke had learned that Dr. Lawrie predicted fabulous goodies, and there was nothing to fear. He was truly Pavlov’s dog! A team player in every sense of the word, Dr. Lawrie looked to me for direction. This wasn’t about titles or degrees or hierarchy. This was cooperative care personified. We were all working together as Zeke’s care team towards a unified goal. While Zeke stationed, Dr. Lawrie did a few warm-up approaches with the syringe. He showed Zeke the syringe each time. There would be no “sneak attacks” on our watch. I was studying Zeke’s face so intently for the first signs of stress or discomfort – a furrowed brow, a hard stare – that I didn’t realize he had received the injection. Zeke didn’t seem to realized it either. Our reaction in the video says it all. In the week following his vet visit, Zeke’s Facebook post reached over 20,000 people around the world. Zeke had become an ambassador for fear free husbandry and force-free training. People loved the story of a dog his size, breed, and history learning to become a cooperative and happy participant in his own veterinary care. Zeke brought many viewers to tears, and they cheered his success. I could not be more proud of him! Zeke was scheduled to receive his second vaccine in four weeks, which brings us to back to yesterday. His story has come full circle. Zeke received his second injection happily and uneventfully. It was no big deal this time around. Dr. Lawrie commented, “It gets easier and easier every time.” We said our goodbyes, packed up our gear, and Joan snapped the post-injection photo below. This visit felt anticlimactic compared to the last. Then I realized the reason why. A happy vet visit is the new normal for Zeke. And my heart burst. 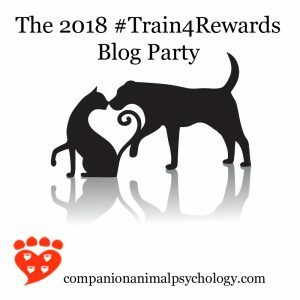 I’m pleased to be participating in the 2018 Train for Rewards Blog Party!